I haven’t done anything like this yet. It’s fun to look at. I’d encourage you to go asymmetrical more! It’s beautiful, and a great step out of that box! Sure to make some child very happy! 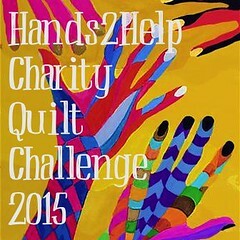 Thanks for participating in the Challenge this year! Thanks – I had a lot of fun making it. I am proud to have it go to Nita at Because you Matter, to be part of her outreach project. I think that it is exciting that it is going to be ‘gifted’ to a child so far away from me! Thank you! There is just something about pink, white and black that I love! My ‘Lovely Flower Baskets in the Window’ was also pink, white and black, but in that case, the pink was a softer pink, and the embroidered flower baskets had a hint of teal that was a nice compliment to the overall composite.